It is all change for us in 2017! We are regretfully saying goodbye to Bishop David Williams, who has been the chair of our management committee since the very start. Bishop David was one of the initial people with the vision to create Street Pastors in Winchester, and we are forever grateful to him for that. When Street Pastors started in Winchester, Bishop David was Reverend David, and vicar of Christ Church, Winchester. 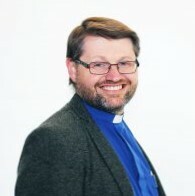 He has been incredibly generous with his time, especially for the last two and a half years whilst he has juggled his responsibilities as Bishop of Basingstoke, with his responsibilities as Street Pastor chair. He is leaving the role of chair to pursue other roles, such as a governor for Peter Symonds College. “I have always admired the work of Street Pastors as an act that reflects the love Jesus shows to the world – it takes commitment, sacrifice and genuine love to be either a Street Pastor or a supporting Prayer Pastor. It changes lives and shows the world that there is another way to live, a self giving way that cares for people where they are. So it is a real honour to be able to lead something which gives so much to Winchester and makes such a difference to individuals. We are looking forward to the direction that the Lord will take us under Ed’s leadership, and are excited for his first AGM as chair, in May. « Merry Christmas from Winchester Street Pastors!